Claiming 'incitement,' Israel shuts down Palestine Today, arrests Palestinian journalists, and convinces a French satellite company to drop a Palestinian TV station. Early in the morning on Friday, March 11th, dozens of Israeli soldiers raided the offices of Palestine Today (Falastin al-Yawm) in al-Bireh in the West Bank. The soldiers damaged the TV station’s offices, confiscated technical equipment, and ordered the station's closure with a military order. The Israeli Army claims the TV station is guilty of “incitement” against Israel. During the raid, Israeli forces arrested two employees of Palestine Today: Mohammed Amr and Shabeeb Shabeeb. Israeli soldiers proceeded to raid TransMedia Production Company in the West Bank city of Ramallah. TransMedia provides satellite TV services to stations in Palestine; it is the broadcasting servicer for Palestine Today. At the same time, another group of Israeli soldiers sought out Farouq Elayyat, the General Director of Palestine Today, at his home in Birziet and arrested him as well. Israeli forces released Amr and Shabeeb after holding them for a few hours. Elayyat, however, remains detained. Groups from across Palestinian decried the closure of Palestine Today. The Palestinian Journalists Union, Palestinian Liberation Organization and human rights centers issued statements condemning the closure of the station and described it as clear evidence of the occupation’s intent to both broadly restrict freedom of press in Palestine and specifically restrict news coverage on the current popular uprising. The Islamic movement and other concerned Palestinians gathered outside of Palestine Today’s offices in Gaza to protest the TV station’s closure in the West Bank. Palestine Today was able to continue broadcasting this weekend from its Gaza offices. Al-Aqsa TV was back on air on Saturday, however, with the assistance of the Egyptian satellite company Nilesat and Arabsat, a company stationed in Saudi Arabia. Despite its new partners, the TV station’s future remains in question: some speculate Israel hoped for Arab satellite companies to take on al-Aqsa TV so that Israel can pursue its demise without the diplomatic hang-ups posed by closing a TV station in France and, perversely, with the opportunity to justify its actions by appealing to anti-Arab racism in the Western world. Israel’s renewed commitment to suppressing Palestinian media was set into motion by an impromptu Israeli security meeting last week, at which Netanyahu ordered Palestinian media channels broadcasting “incitement” to be shutdown. Israeli authorities’ quick actions against Palestinian news stations and journalists over the weekend, both at home and abroad, indicate that Netanyahu’s recent order harbors severe repercussions for Palestinian press. However, this is not the first time Israel has silenced Palestinian media: four months ago, the Israeli occupation closed four Palestinian radio stations – two in Hebron, one in Jenin and the fourth in Nablus. 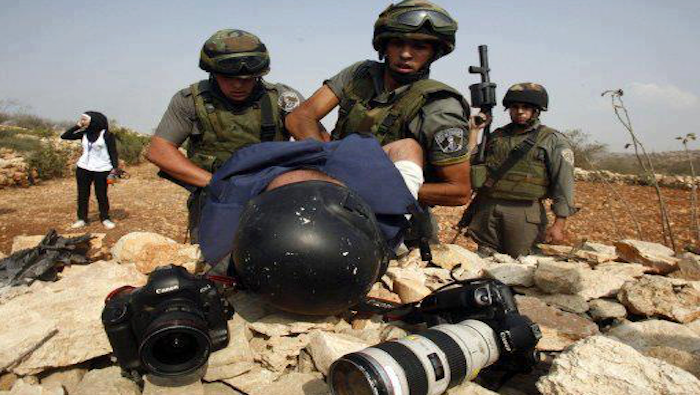 Moreover, there are at least eighteen Palestinian journalists currently in Israeli detention.